Single occupancy when available. New Camp $100 per day / Our other camps $50 per day. Non Fishing guests when available $250.00 per day (with a fishing guest). Above prices do not include tax and gratuities. Upon booking a full week at the Restigouche River Lodge your fishing will be under the following system, we have devised this to give every guest in camp an equal opportunity on the water. We also would like you to know just how you will be fishing and what to expect during your visit at the lodge. 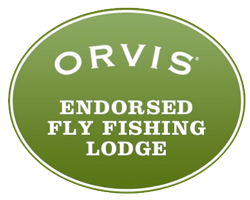 On full days anglers will enjoy two fly fishing sessions, morning and evening and on half days a morning or evening session. All fishing is with one of our guides and guests are in pairs. A single guide (one on one when available at an additional fee) Anglers both fish at the same time, only when both anglers are in the canoe alternating fishing is required. The Restigouche River Lodge has motor powered 26 foot canoes that take you to your pool for the morning or evenings fishing. All your fishing is on the lodge’s private and exclusive stretch of three and a half miles of the Restigouche River, in addition for majority of the season we have a an additional two miles of adjacent water. Anglers rotate each session through the pools so that each angler gets a morning and evening session on the pools being fished. Depending on the number of guest in camp we could be fishing an odd or even number of canoes. For an odd number of canoes the rotation just continues and in the even canoe scenario one day during the week anglers will fish the same pool for an evening and morning session. This will insure that all anglers that have booked a full week will get a morning and evening session on the pools being fished. The canoes and guides always stay in rotation week to week and the guests simply board an available canoe when they arrive at the lodge. During your week stay you will fish a total of 13 sessions. Your arrival time for a normal week is Sunday at 3:00 pm you will fish that afternoon till dark and then 2 sessions a day through Saturday. Departure is after breakfast on Sunday am. If you would like a bit of extra fishing, Sunday morning fishing can be arranged if available. 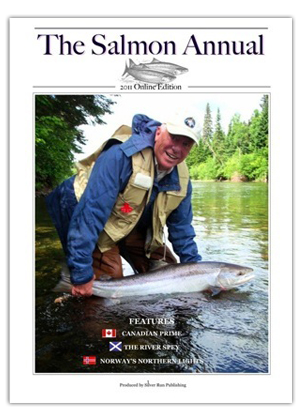 The RRL has some the finest wadding and spey water in eastern Canada and you should advise us of your preference when you book your trip. You will enjoy 7 night’s lodging in either of our three guest’s camps, double occupancy with private baths. With the addition of our new lodge single occupancy and some non-fishing guests trips can be booked every week of the season. You will enjoy three daily meals, breakfast is served from 7:00 to 8:30, the main meal is served at 1:30 and a late night meal is served after the evenings fishing. The dinning is built around the fishing and your meal times might change according to the time of the season, weather and river conditions. We are happy to accommodate our guests on any special dining requests or food allergies. Please inform us before your trip of any special requests that you might have so we will be prepared upon your arrival at the lodge. Prior season’s guests with full week bookings are given rebooking seniority for their week or may move to another available week. Seniority is then given to guests with non-prime weeks, partial week bookings and new guests on first come first served basis when booking a full week. Partial week bookings are given out at the discretion of the Restigouche River Lodge. You maintain seniority for your week by requesting to rebook the week for the following year. Request must be made at time of departure or within two weeks from the end of your trip. The Restigouche River Lodge will do all it can to notify prior guests of their opportunity to rebook their week by email and phone contact if possible. Bookings are held for one week to receipt of deposit at which time the Restigouche River Lodge can offer the week or partial week trip to other clients. A deposit of %50 is required at the time of booking your week and the final payment is due on your full payment date. Trips booked within 60 days of arrival time require full payment at the time of booking. A reservation may be cancelled automatically and your deposit forfeited if we have not received full payment by your full payment due date. There will be no refunds or credits given unless your trip is rebooked as stated below in cancellations. The reservation and cancellation policies used by the Restigouche River Lodge are standard in this industry. We recommend that you look into purchasing travel insurance for your trip protection. 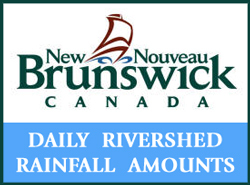 Cancellations are only refunded by the Restigouche River Lodge upon your trip being rebooked. If you cancel your trip for any reason you must notify the Restigouche River Lodge by email or in writing. At the time that the week is filled we will do all we can to rebook your spot in that week. We will then make every attempt to rebook your trip at the full price or need be for a discounted price. If the Restigouche rebooks your trip you will receive a refund in the amount of the rebooked trip price less a 6% administrative fee. You also can notify us if you have someone to take your trip however you are responsible for the full payment.